At the same time, the Chinese Academy of Medical Sciences Peking Union Medical College also published the article "Protection of the Ark of Life for the Health of the People - The Life of the Virologist Gu Fangzhou" on the homepage of his official website on January 3, mourning the dead. The abstract is compiled from Xu Yuan, published by Jiangsu People's Publishing House. 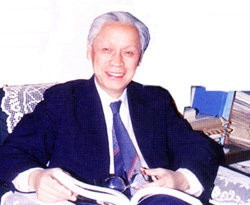 Gu Fangzhou was born in Ningbo, Zhejiang Province in 1926. He graduated from the Medical Faculty of Peking University School of Medicine in 1950. He graduated from the Institute of Virology of the Soviet Academy of Medical Sciences in 1955 and obtained a doctorate in medicine. Gu Fangzhou served as the president of the Chinese Academy of Medical Sciences Peking Union Medical College, the Standing Committee of the Chinese Association of Science and Technology, and the chairman of the Beijing Association for Science and Technology. He was elected as a member of the Royal Academy of Sciences (London), a member of the European Academy of Sciences, Arts and Literature, and the third. Academician of the World Academy of Sciences. It is worth mentioning that Gu FangzhouStudying the prevention and control of polio for 42 years is one of the pioneers in the organization and cultivation of oral live vaccines in China, and has made important contributions to the great project of eliminating polio in China. In 1958, Gu Fangzhou isolated the "polio" virus for the first time in China, providing a scientific basis for the development of immunization programs. In the early 1960s, he developed two live vaccines for liquids and sugar pills, which saved hundreds of thousands of children from maiming. He also proposed the use of live vaccine technology to eliminate "polio" and the immunization program suitable for China's geographical conditions. And immunization strategies. Gu Fangzhou presided over the development of China's first "polio vaccine manufacturing and verification procedures", and guided the production and identification of billions of vaccines in China over the past 20 years. During the development of the vaccine, there was a "fun" conversation between Gu Fangzhou and then Premier Zhou Enlai. According to the article "Providing the Life of the Ark of the People--A Life of the Virologist Gu Fangzhou", as early as 1958, before the Ministry of Health sent Gu Fangzhou to the Soviet Union to investigate the production of the dead vaccine, the government considered the production of vaccines. It was decided to establish a monkey experiment station in Yunnan. In January 1959, the Ministry of Health approved the establishment of the experimental monkey station, which was being established, as the Institute of Medical Biology, as a production base for polio vaccine in China. In the spring of 1960, Premier Zhou Enlai passed through Kunming on his way to Myanmar. Accompanied by Yunnan Governor Liu Minghui and then Assistant Foreign Minister Qiao Guanhua, he came to the vaccine production base. At the time, Gu Fangzhou said to the Prime Minister who was inspecting the vaccine: "Premier Zhou, if our vaccine is produced and given to children under the age of 7 in the country, we can eliminate polio!" Zhou Enlai listened, straightened up and asked seriously: "Is it?" "Yes!" Gu Fangzhou patted his chest. "We have confidence!" Zhou Enlai smiled happily and joked: "So, are you not going to lose your job?" Gu Fangzhou was also driven by the mood of the Prime Minister. His nervous heart relaxed and said: "No! This disease is gone, we have to study other diseases!" Premier Zhou patted his shoulder and applauded: "Okay! Have this ambition!" In 1990, the national polio eradication program was implemented. The number of cases has declined rapidly year by year. Since the last patient in Shuyang County, Hubei Province in September 1994, no cases of polio caused by native wild viruses have been found. In 2000, the "Signature Ceremony of the Confirmation Report on the Elimination of Polio in China" was held in the Ministry of Health. At that time, the 74-year-old Gu Fangzhou, as the representative, signed his own name. In October of that year, it was officially confirmed.The spread of native Chinese “polio” wild viruses has been blocked and become a polio-free country.